The question of immigration is looming large across the world. Many countries have implemented policies to reduce migration. But perhaps no policy has received more attention than President Donald Trump’s proposed wall on the US-Mexico border. There is an active economic literature looking at how border enforcement influences migration and therefore the economy (e.g. Hanson and Spilimbergo 1999, Lessem 2018). What would be the effect on the economy of building the wall? Did the Secure Fence Act reduce unauthorised migration to the US? What impact did the Secure Fence Act have on the economy? Could alternative policies, such as facilitating trade, reduce migration? The Secure Fence Act (Pub.L. 109-367) authorised the construction of reinforced fencing on locations of the border in California, Arizona, New Mexico, and Texas. Between 2007 and 2010, 548 miles of wall were constructed along the 1,954-mile US-Mexico border, bringing the total fencing to 658 miles. Figure 1 shows the location of the new wall and the pre-existing wall on the US-Mexico border. We used engineering reports of the wall location to measure the additional distance migrants needed to travel to avoid the wall. 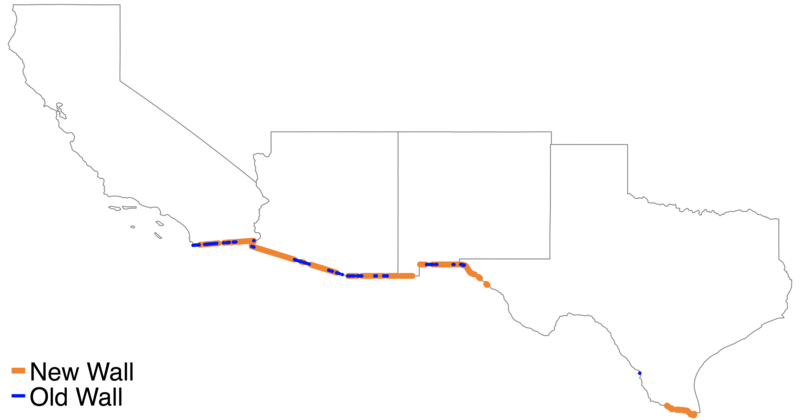 For every municipality in Mexico and county in the US, we calculated the shortest distance to travel avoiding the border wall, both before and after the border wall expansion. This increase in distance is our pair-level measure of exposure to the Secure Fence Act. How to quantify unauthorised migration? One challenge with studying the effects of border enforcement is that many migrants who are crossing the US-Mexico border are doing so without legal authorisation. These migrants may then be difficult to find in databases. To get around this challenge, we use data from the Mexican government's Matrícula Consular (Consular ID card) database. Mexican citizens can apply for a Matrícula Consular from Mexican consulates in the US. This card can be used as a form of identification to, for example, open bank accounts and send money through Western Union. The Matrícula Consular is particularly useful for unauthorised migrants who do not have other forms of identification. We use a confidential version of the database that includes the migrant's municipality in Mexico and the US county the migrant is living in when the ID card is issued. From these data we can construct annual bilateral migration flows between municipalities in Mexico to counties in the US. 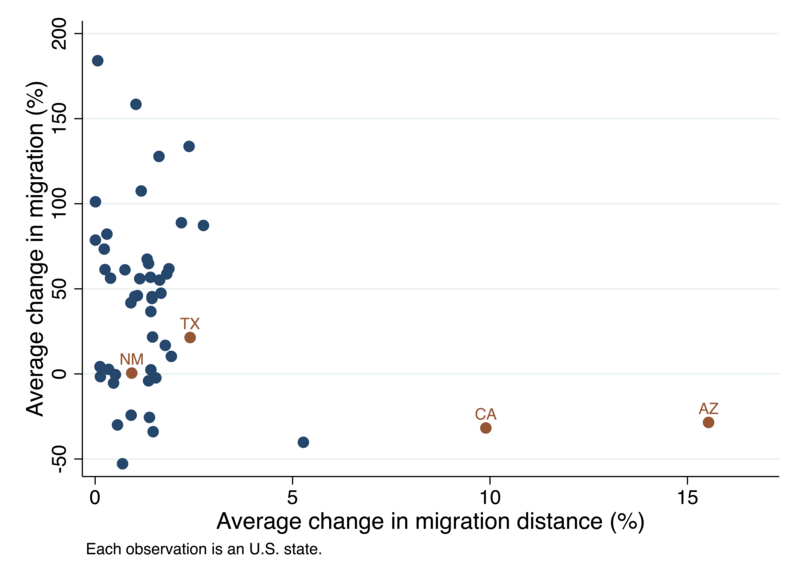 We show that migration decreased relatively more if the migrant faced a larger increase in distance to travel to the US after the Secure Fence Act. This relationship is shown in Figure 2. We run analyses in the paper isolating the effect of the change in travel time on migration. Our methodology allows us to account for the effect of shocks, such as the Great Recession or Arizona's SB 1070 law (which required police officers to demand papers from those suspected of being in the country illegally) in the destination location by comparing changes in migration from different origins to the same destination. Similarly, by comparing changes in migration from the same origin to different destinations, we can account for the effect of shocks in the origin location. Our estimates imply that the direct (partial equilibrium) effect of the Secure Fence Act was to reduce long-run migration from Mexico by 0.8%. However, this direct effect does not account for the indirect changes that the wall might cause. For example, if wages in the US increase for migrants because there are fewer migrants arriving, then this may lead to smaller reductions in migration. To compute the total impact (i.e. accounting for general equilibrium changes) on the economy, we use an economic model. In the model, the labour market comprises low-skill and high-skill US-born and Mexican-born workers; it is costly to migrate between locations; and it is costly for firms to sell their goods across locations. Once we account for all these general equilibrium effects, our estimate of the effect of the wall on migration falls slightly: we estimate that the overall effect of the wall was to reduce migration by 0.6%. Using the economic framework, we then compute the economic effect of the wall. We estimate the main parameters of the model using the variation in migration we observe as a result of the Secure Fence Act. The wall can lead to many changes in the economy: it may lead to higher wages, which will then impact prices of goods (a ‘terms-of-trade’ effect). Because unauthorised migrants primarily have low levels of education, it may change the relative returns for other low-skill workers in the economy (a ‘labour market’ effect). If US workers change where they live in response to the wall, then they may gain or lose different amenity values of living in a location (a ‘preference’ effect). Accounting for all these terms, we estimate that low-skilled US workers gain the equivalent of $0.36 in higher annual wages after the Secure Fence Act. This result is driven by the fact that low-skilled US workers become relatively scarcer in the economy. We estimate that high-skilled US workers lose the equivalent of $4.45 in higher wages after the Secure Fence Act. These numbers are below the $7 per person cost of the wall expansion. We also carry out substantial robustness checks of our results. Across a wide range of parameter values, college-educated US workers are never made better off from the Secure Fence Act, and the economic benefits for less educated U.S. workers never exceed $3.62 – well below the $7 per person cost of the wall expansion. With the estimated model we can undertake policy experiments. One such experiment is considering trade policy. We simulate a 25% reduction in trade costs between Mexico and the US. This, in turn, should facilitate specialisation, increasing wages in both the US and in Mexico. We estimate that migration flows between Mexico and the US would fall by more than that caused by the Secure Fence Act. Unlike the Secure Fence Act, however, reducing trade costs substantially benefits US workers – raising college educated US workers' welfare by an equivalent of $80.59 in annual income and less educated US workers' welfare by an equivalent of $58.67 in annual income. Economic theory suggests that migration will depend on both the costs of migrating and the returns from doing so. The Secure Fence Act was a policy that increased the costs of migrating. While the border wall expansion led to a small change in migration, its direct costs were substantial, and the indirect effects on the US economy were largely negative. Our results suggest that alternative policies that instead change the returns to migrating – for example, by improving economic outcomes in Mexico by reducing trade costs – may be more effective in reducing migration while also benefiting US workers. Allen, T, C Dobbin and M Morten (2018), "Border Walls". Hanson, B G H and A Spilimbergo (1999), "Illegal Immigration, Border Enforcement, and Relative Wages: Evidence from Apprehensions at the U.S.-Mexico Border", The American Economic Review 89(5): 1337–1357. Lessem, R (2018), "Mexico-U.S. Immigration: Effects of Wages and Border Enforcement", Review of Economic Studies 85(4): 2353–2388.